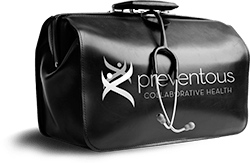 At Preventous Collaborative Health we want your experience to be relaxing and positive. Our professional, yet comfortable and elegant centre is conveniently located just outside Calgary's downtown core, along popular 17th Ave SW.
Our facility is a unique Calgary medical clinic designed to allow us to take care of all your health needs. There are several functional spaces, a medical area and a lifestyle area. In the medical area, you’ll find two well-appointed offices with attached examination rooms. We also have a minor treatment room to accommodate various procedures including suturing and casting. In Calgary, medical clinic lifestyle areas are uncommon. At Preventous, we think our lifestyle area is just as important as our medical area. The lifestyle area contains the offices of our dietitian and personal trainers. This side of the centre also has a gym and assessment fitness area equipped with state-of-the-art apparatus. You’ll find comfortable changing areas for freshening up before getting on with your day.